Afternoon Loverlies! I didn't do much this weekend except for visiting my mother in law. We ate some nommy fish tacos. I actually love fish tacos, dangit, I want them now. 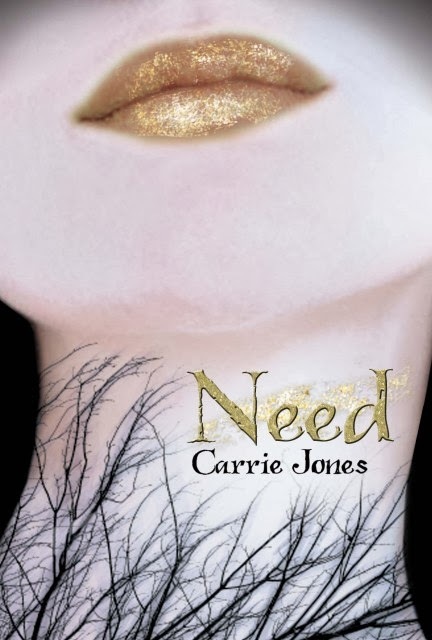 I finished one of my library books over the weekend called Need written by Carrie Jones. This book took me took me by surprise, basically that there are non humans in this book. I of course didn't read the synopsis or what type of book this was. I just grabbed it to read because I love the gold lipstick on the cover of this book. It is about a girl named Zara pronounced like Sara but with a z. Her step father has passed and she becomes deeply depressed. So depressed she doesn't act herself anymore. Her mother feels it is best to send her to Maine to stay with her step grandmother. Turns out the reason she is sent to stay with her step grandmother is to keep her safe from someone. This someone is apparently a man that has been following her. What a Creeper! This book I think is not too slow getting into what the story is, which is good. I feel frustrated whenever a book starts off so slow, and takes forever to get into where the story gets good and adventurous. It doesn't take long to figure out what's going on. I will say why her mother sent her to live in Maine because she was depressed makes no sense. Maine is cold, snowy, and gloomy, not where one who is depressed should be sent to. The moms thinking I believe wasn't at all smart. Other then that, I found it very interesting and easy to read. I believe I will read the other books of this series. Ta Ta For Now!